Oral argument on the Superior Court case of Sehl v. Neff has been set to take place on April 27, 2011 at 9:30 a.m. in Philadelphia. This is the post-Koken venue case in which the UIM policy did not have a venue selection clause and the Plaintiff filed suit in Philadelphia County even though the tortfeasor Defendant did not reside in Philadelphia County and even though the accident did not occur in Philadelphia County. 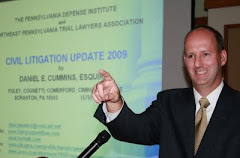 I wrote the amicus curiae brief on behalf of the Pennsylvania Defense Institute in favor of the position that venue is not proper in Philadelphia under the circumstances presented. If you wish to review that Brief, it may be accessed by clicking on the link in the JDSupra.com box down on the right-hand column of this blog. Continuing updates will be provided on this case as it proceeds.